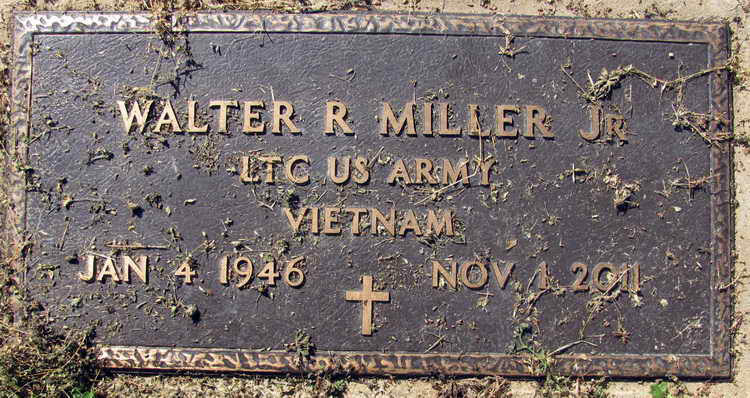 Grave marker for Walter R. Miller, Jr. in Wintergreen Cemetery, Port Gibson (Claiborne county), Mississippi. Walter enlisted in Army at Jackson, MS, on 31 August 1964, and went through Basic training and AIT (Advanced Infantry Training) at Fort Polk followed by jump school at Fort Benning. He then served 5 months in the Panama Canal Zone with the 508th PIR before retuning to the U.S. and a new posting with the 101st Airborne Division at Fort Campbell, KY wher he prepared for deployment to Vietnam. On 24 July 1960, he received a commission as a second lieutenant after graduating from OCS, Class 502-7, at Fort Benning, GA.
Miller took jump training at Fort Benning and was then assigned to the 508th in Panama where he served for 15 months. When he returned to the states he was transferred to the 101st Airborne Division at Fort Campbell, KY in preparation for deployment to Vietnam. While in Vietnam, he was awarded the Bronze Star Medal, the Army Commendation Medal, and the Vietnamese Cross of Gallantry with Palm. Upon returning to the U.S. in November, 1968, he was assigned to ROTC Instructor's Group at University of MS and remained there until attending OCS in February, 1970. Lt. Miller served as executive officer, HHC, 4th Student Battalion, Fort Benning and was then transferred to Camp Wolters, TX for helicopter flight school. Returning to Vietnam, he would earn the Distinguished Flying Cross with 4 Oak Leaf Clusters and the Air Medal, with 1 Oak Leaf Cluster and the "V" device for heroism in combat flight..